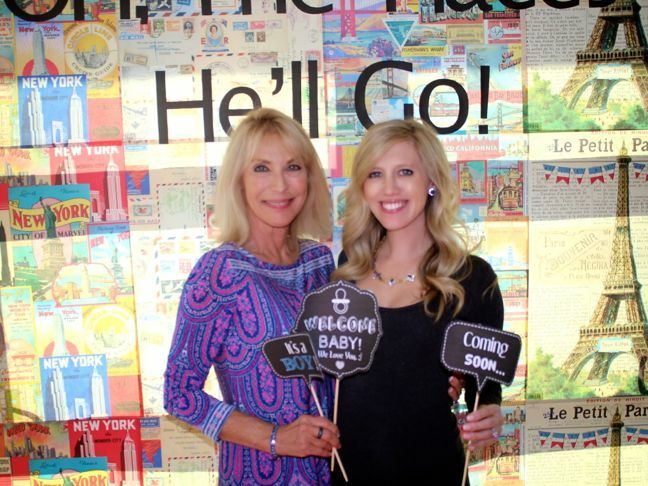 Dr. Seuss said it best, and then Shannon and Kelsey, friends of mom-to-be Serena planned the rest! Serena and her husband both have travel-based degrees and jobs, and (not surprisingly) love to travel. 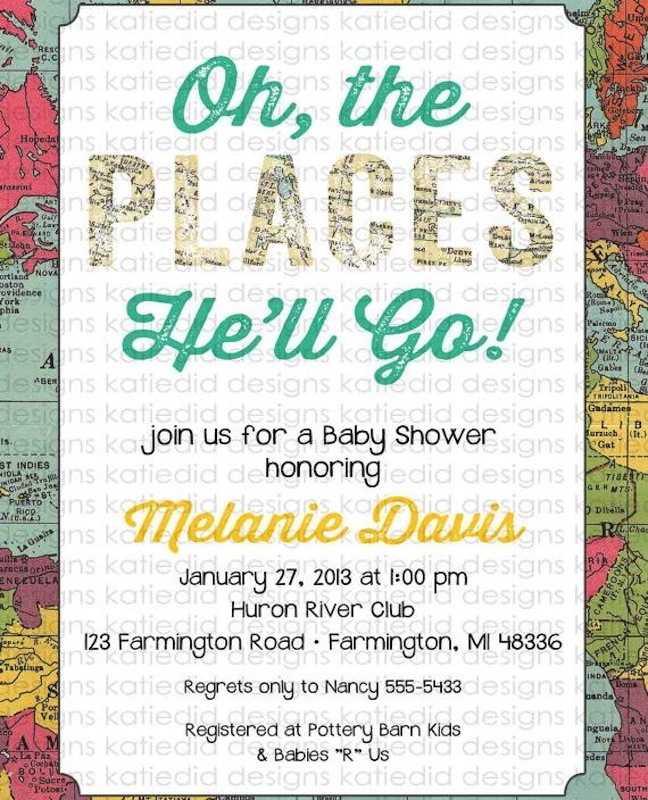 Her friends thought a travel-themed shower was certainly in order. 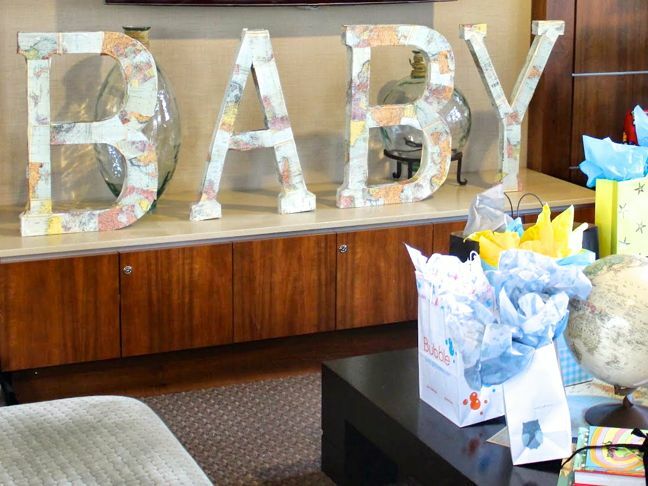 Serena’s friends and family sent her off and away with lots of love, baby essentials, and wonderful memories at her recent Oh, the Places He’ll Go (from the Dr. Seuss book Oh, the Place’s You’ll Go) baby shower! 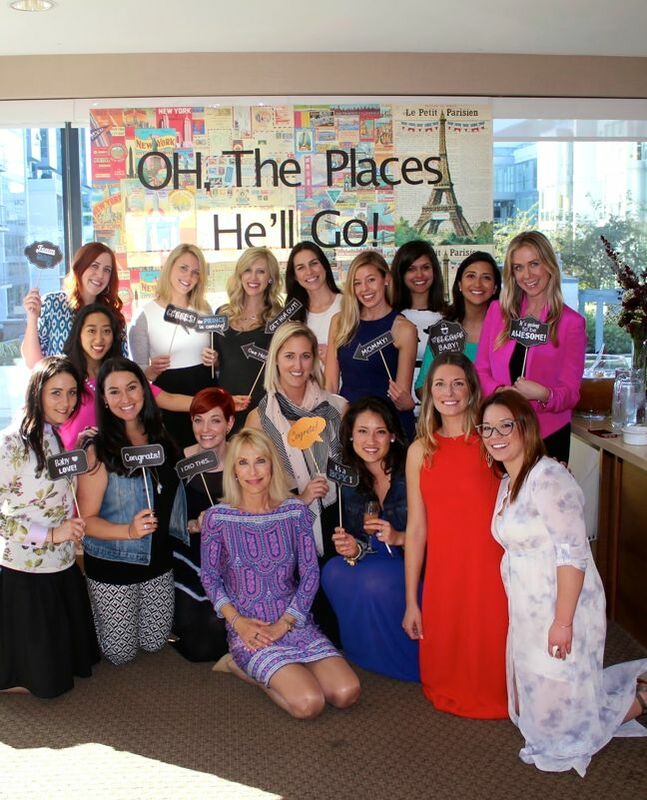 The shower hostesses were gracious enough to share all of the party details with me today, including how they created the DIY Oh, the Places He’ll Go photo booth. Step 1: Measure the space of the travel themed photo booth and order enough paper to fill the wall or window. I used twelve sheets with three different styles. Step 2: Download the font Doctor Soos from dafont.com, resize the text to the size you want on Microsoft Word, print, and then cut the letters. Step 3: Print out the props (here and here) on thick card stock, trim accordingly, and glue to a thick wooden skewer. Step 4: Tape the wrapping paper to the wall. 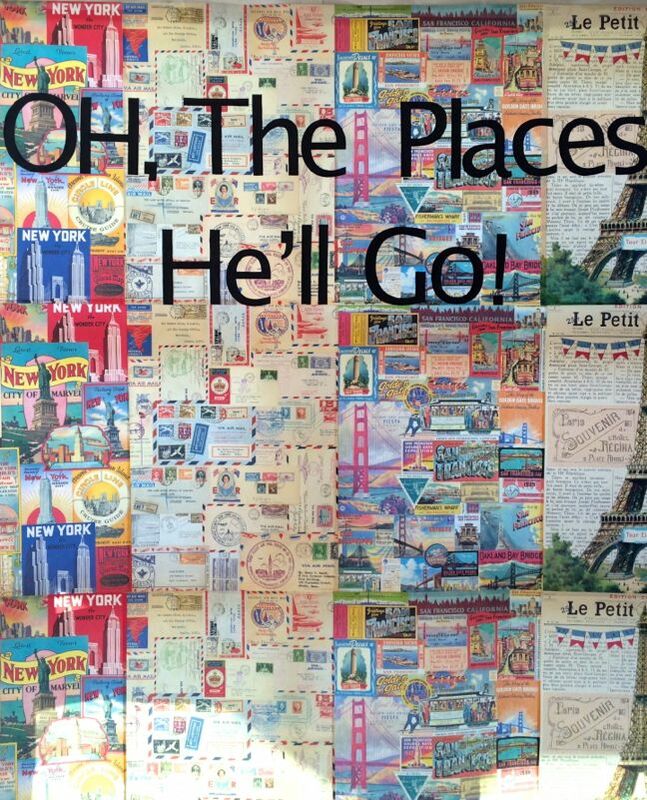 Step 5: Tape the Oh, the Places He’ll Go letters in the middle of the photo booth wall. 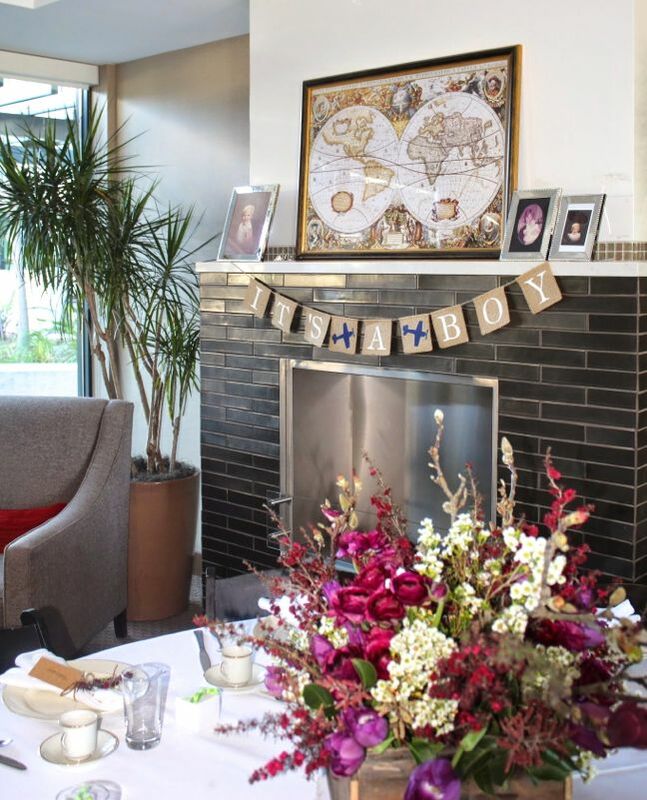 Step 6: Set up a table of props for guests to take photos with. 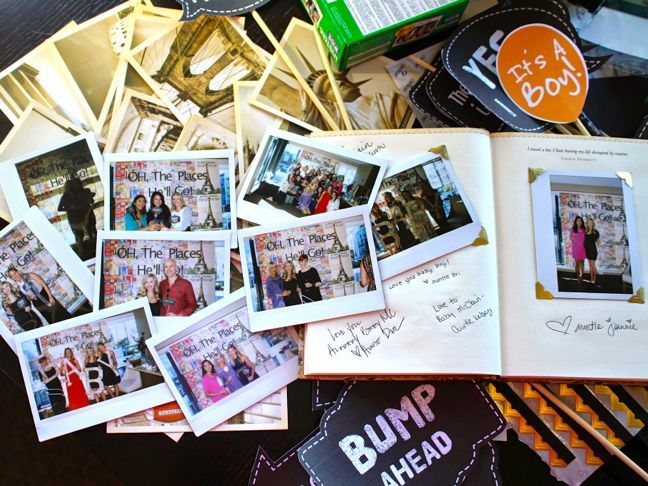 Step 7: Next to the photo booth, make sure a journal is ready with pens and tape for guests to write a special note to mom and baby next to their photo for a special keepsake item. 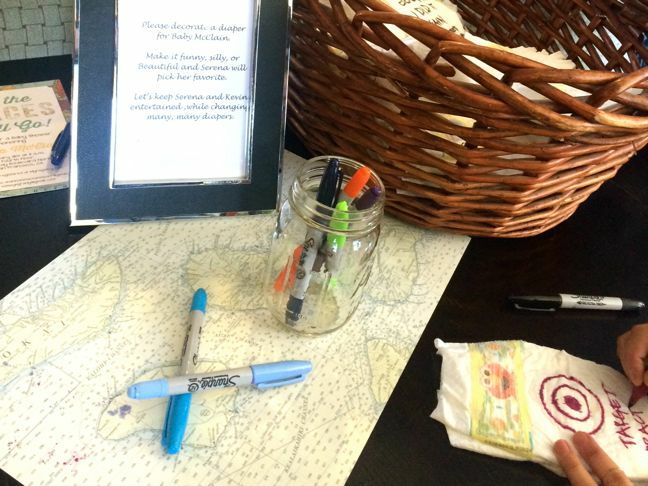 We also had vintage postcards on the table so guests could write a postcard message to the new baby boy. 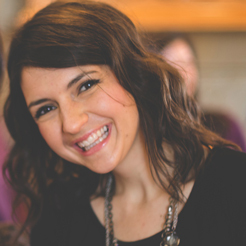 Invitations: We set the tone with a fun, travel themed invite from Katiedid Designs. 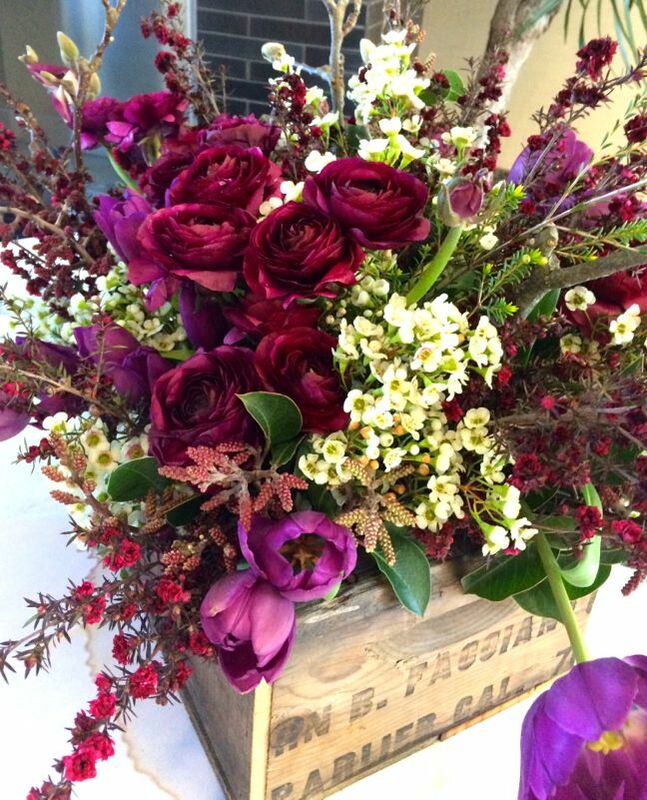 Flowers: I am not a florist, but fortunately the flower market in San Francisco has the most amazing array of vendors. I found the vintage wood boxes there, and because we did not have a color scheme in mind, I simply went for what caught my eye. The market had some unique dark purple ranunculus and dark lavender tulips, which I thought were a good start. 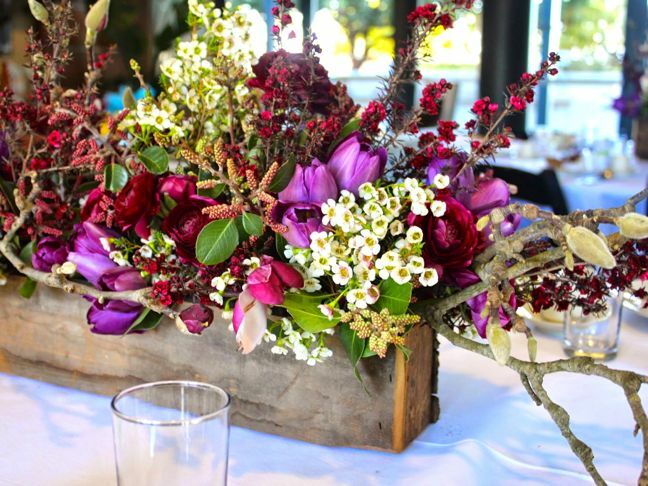 Add a little white wax flower and some blooming magnolias, and voila! 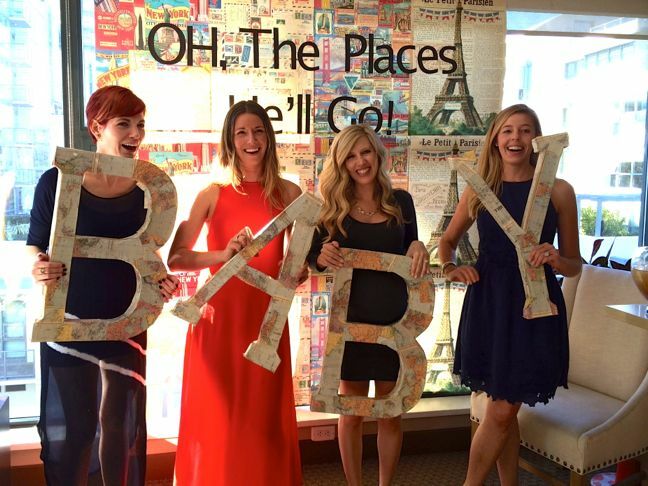 B-A-B-Y Letters: Kelsey ordered cardboard letters from Amazon and cut out Cavallini map wrapping paper from Paper Source and decoupaged the letters using Mod Podge and a paintbrush. 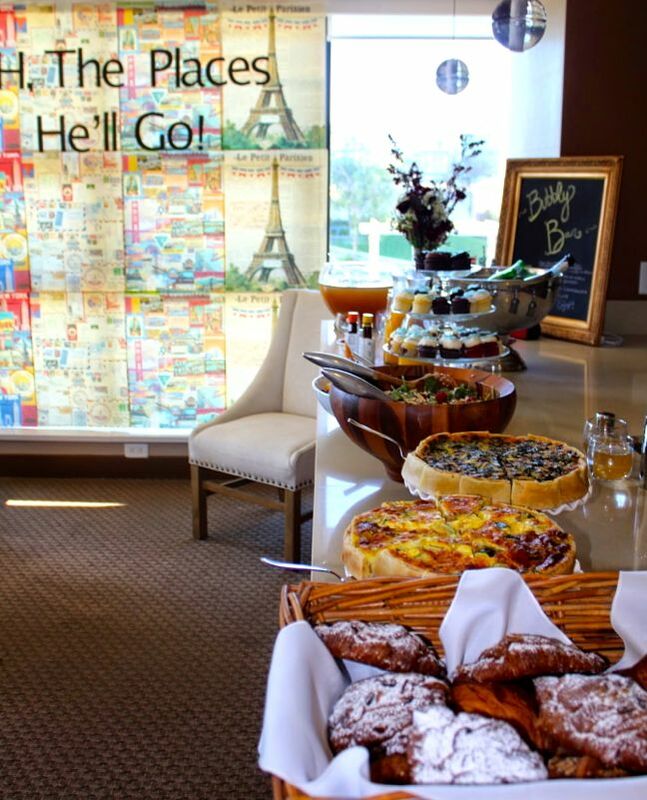 Menu: Sticking to the travel theme, Kelsey planned a light and flavorful French bistro lunch menu. 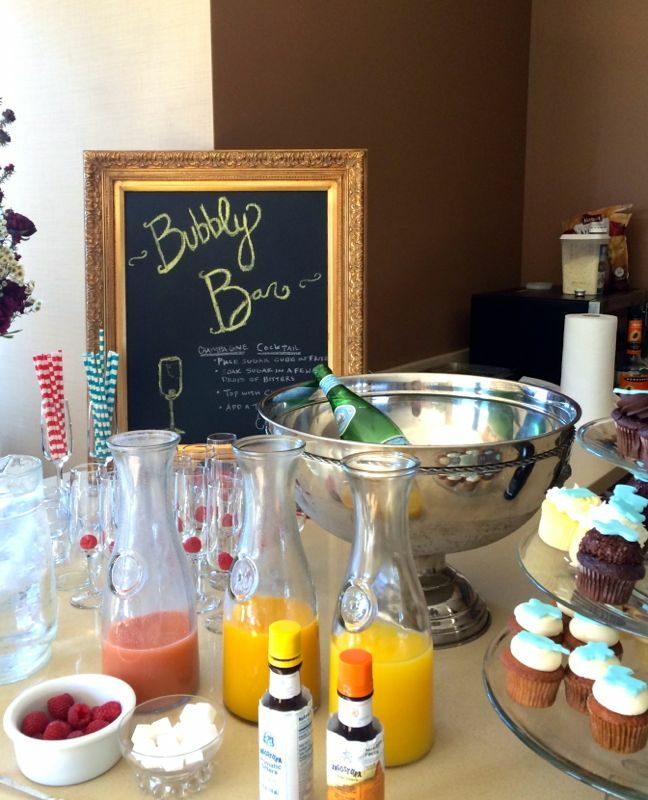 Bar Menu: A framed chalkboard welcomed guests to the Bubbly Bar. 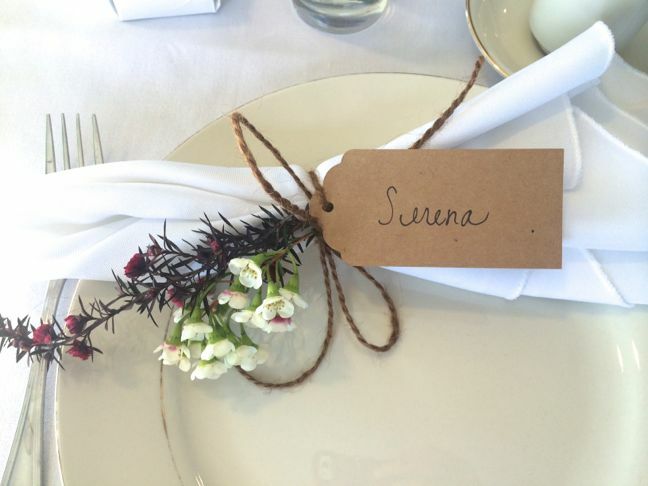 Place Settings: We had beautiful place settings with paper luggage tags as place cards that were decorated with flowers. 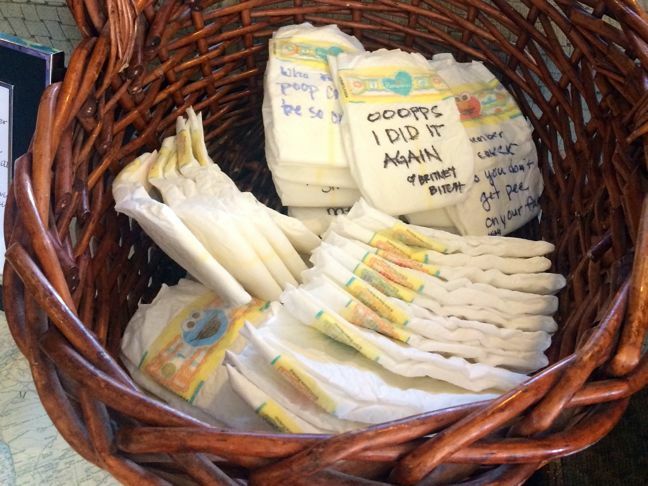 Diaper Notes: Guests wrote funny notes to entertain Mom and Dad when they change all their little man’s diapers in their near future.